FOREST CITY, IA--(Marketwire - July 10, 2008) - Winnebago Industries, Inc. (NYSE: WGO) is unveiling a never-seen-before, cutting edge floorplan at the Family Motor Coach Association (FMCA) Convention in Minneapolis, Minn., July 14-17. "The 2009 Winnebago Outlook 30D is not your typical Class C motor home," said Winnebago Industries' Chairman of the Board, CEO and President Bob Olson. "One look inside the new 30D floorplan and you'll realize this is a totally different coach. We've taken the conventional bedroom area and transformed it into spacious living and dining space that is also perfect for entertaining. Plus, you have plenty of sleeping space too. This is a revolutionary floorplan that we're extremely excited to show in Minneapolis." The first-of-its-kind, double slide Winnebago Outlook 30D is striking, spacious and fun. With optional full body paint offering a striking exterior, the interior features an innovative layout with the bathroom and opposing wardrobe behind the front cab seats. The spacious wardrobe is not only a great place for storage, but it also houses pull-out stair steps so you can easily access the front bunk when night falls. The front bunk area also features a skylight and an optional 15-inch LCD TV. A fully functional galley is just aft the entry door, with a U-shaped lounge nestled in the rear, driver's side slideout room. A sofa/sleeper is opposite the dinette and sits in the second slideout room on this model. In the back is an UltraLeather Euro chair and ottoman that are positioned so you can easily see the large 32-inch LCD TV that also includes a Home Theater Sound System. "Along with the new Outlook 30D, we're also showcasing our totally redesigned Winnebago Aspect and Itasca Cambria lines, that feature the new 30C model that is our Company's first triple slide Class C. The addition of these new floorplans to the rest of our already outstanding Class C lineup further secures our position as the top Class C manufacturer -- a distinction we've held for the past 11 years," said Olson. A number of other exciting models will be on display this week in Minneapolis. The Winnebago brand will feature the exclusive View 24P. The 24P features a front sofa slide and bunk beds in the rear, with two optional DVD players with 8.5-inch LCD players available for added bunk fun. Built on a Dodge Sprinter chassis, the fuel efficient View also boasts a powerful Mercedes Benz diesel engine. 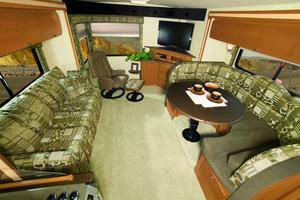 The highly popular Winnebago Adventurer features the exclusive 35Z and 38N in Minneapolis. The triple slide 35Z features an innovative wardrobe option that can convert into bunk beds for added sleeping space when the grandchildren come along, while the new 38N features opposing slideout rooms up front for an incredibly spacious living area, as well as large bathroom and impressive bedroom with a 26-inch LCD TV also available. On the diesel side, a highlight is the new, triple slide 2009 Winnebago Journey 34Y. The Journey 34Y offers all the amenities of a diesel powered coach in a shorter length that's appealing to RVers. The 34Y features a full wall slide on the driver's side with a sofa/Euro chair and ottoman, while a king bed slideout is on the passenger side of the coach. In the lounge area, you'll love the large 37-inch LCD TV that is positioned above the buffet for perfect viewing from the opposing Rest Easy Multi-Position Lounge or optional Rest Easy theater seating module that are both on display in Minneapolis. The Itasca brand also has a number of new floorplans on display, including the Itasca Sunova 31E. The 31E is a side aisle floorplan with slideout rooms extending both the living area and the rear bed. A standard 37-inch TV is featured in the living area -- just aft the dinette for prime viewing wherever you're seated. The bathroom offers a curved shower, with a roomy wardrobe and full size queen bed found in the bedroom. The top-of-the-line 2009 Itasca Horizon will have the new 40WD on display. The triple slide 40WD is incredibly spacious and luxurious. The lounge area of the 40WD features dual sofas up front and a spacious galley featuring an innovative U-shaped dinette. A 37-inch high definition LCD TV sits mid-coach, while a 32-inch high definition LCD is found in the front overhead cabinets for the ultimate in entertainment! A roomy walk-through bathroom and side aisle access to a standard king-size bed are also found on the 40WD. A leader in the industry for fuel efficient motor homes, the recently introduced ERA Class B motor home will also be in Minneapolis and boasts fuel efficiency of up to 20 mpg. Built on an 8,550-lb. GVWR Dodge Sprinter chassis with a 3L 6-cylinder engine, the 170XL floorplan features a rear 60-inch x 80-inch sofa/bed in the rear, as well as a fully equipped galley and bathroom. Up front, two companion chairs are featured that make for a prime seating area, especially when the moveable pedestal table is positioned up front. When you're parked, the cab seats swivel creating perfect seating for four. The ERA also offers two trim levels, the Touring and Limited, which allows the customer to choose his or her design preferences. About this company Winnebago Industries, Inc.